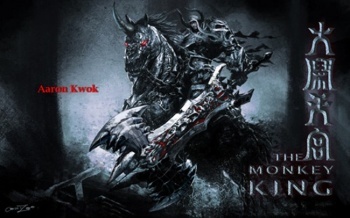 The apocalypse business must not pay that well anymore - Darksiders' War seems to have moved on to Hong Kong action flicks. Remaking the classic Chinese tale Journey to the West is hardly uncommon, really, but Hong Kong director Soi Cheang's upcoming 3D action flick The Monkey King certainly has an, erm, unusual visual take on the matter. The image you see here to the right is concept art for the character of the Ox King, as played by actor Aaron Kwok against Donnie Yen as the Monkey King and Chow Yun Fat as the Jade Emperor. It's definitely a cool look, though I find it hard to imagine that people who are only familiar with the original story could ever identify this guy off the cuff as Ox King. Gamers, however, might be able to identify him as something else entirely. It feels like we've seen him somewhere before, doesn't it? 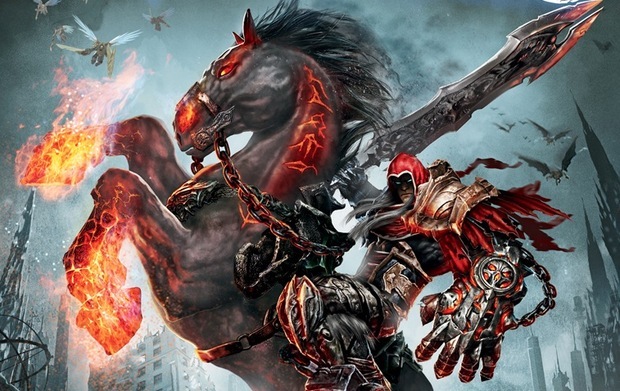 Perhaps in, say, Vigil Games' Darksiders? Granted, as instantly recognizable as Joe Madureira's visual style is, it's definitely not completely and wholly unique in the world of grimdark design. In all fairness to Soi Cheang and the crew of The Monkey King, this is probably just a coincidence. A big, burly coincidence with huge shoulderpads, a demonic-looking horse, and a massive freakin' sword.